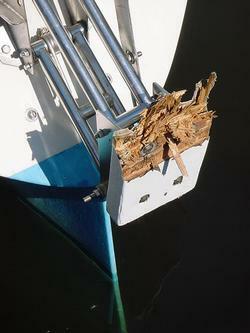 This is why it is highly recommended that you always tie a rope to your outboard. I had spent close to a week trying to mend this motor mount and was anxious to get out and try it. I motored down the ditch okay, but as soon as I gave it some throttle I watched in horror as the additional thrust tore the mount in half and dumped the motor into the bay. I'd never seen plywood do that before. Good thing for me I'd listened to Jack and actually did have a rope tied to it. It probably wasn't underwater more than a few seconds when I was able to haul it back up on deck. Jack's grandson gave me a tow back in and we took the motor over to the house where it started straightaway...whew!